Gosh, What Strange Spring Weather! Good morning. Well, I made it through another night at work. The Mrs started out okay, but as the night went on, she became more of her wicked self until she was finally tucked into bed. However, it is morning now and I'm at home with Pogo and all is well. I'm trying to catch the weather report to see if it is going to warm up today. 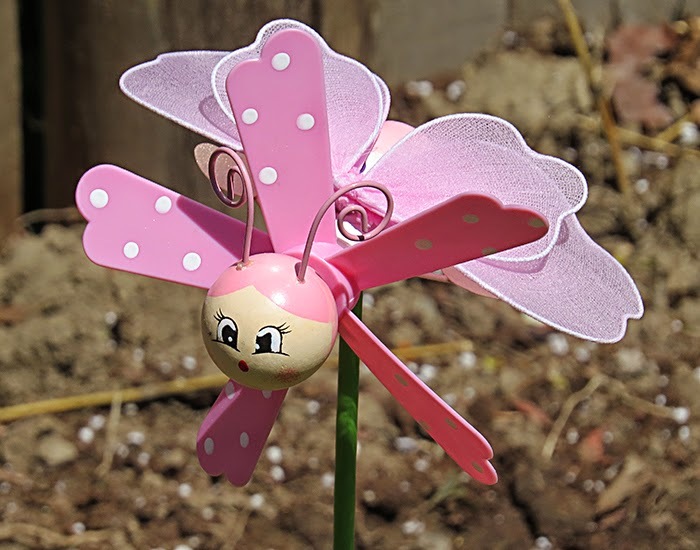 Right now, the sun is shining but it is quite cool (51 F degrees) It is supposed to get up to about 70F with rain this afternoon, and drop back down to 48F overnight with more rain. Tomorrow is only supposed to get up to about 61F degrees with rain. The good news is that Sunday and Monday are supposed to be warm and sunny. And no rain for either day!!!!! Perhaps we'll get to sit out in the yard this weekend after all. We've been hoping to have a barbeque, but by the time all of us can get together, the weather turns cold and wet. What a strange Spring we've been having this year. Last night, I was able to put a few more rows on the raspberry afghan. Tonight, I'm hoping to finish the red, white and blue one. I think when I finish the raspberry afghan and the brown afghan, I might try a different pattern for a while. At least for just one afghan. The pattern I'm using is really nice, and it's easy, but after so many afghans it gets boring. I have a couple of scarfs to finish. Maybe I'll work on them this weekend for a change of pace. Plus I have that knitted pink think to finish. That one has been taking me a while to do, and I'll probably be close to 80 when it is finished. lol. Yesterday I took more photos of my purple rose bush. It may be a small plant, but oh my the blooms are big and gorgeous! 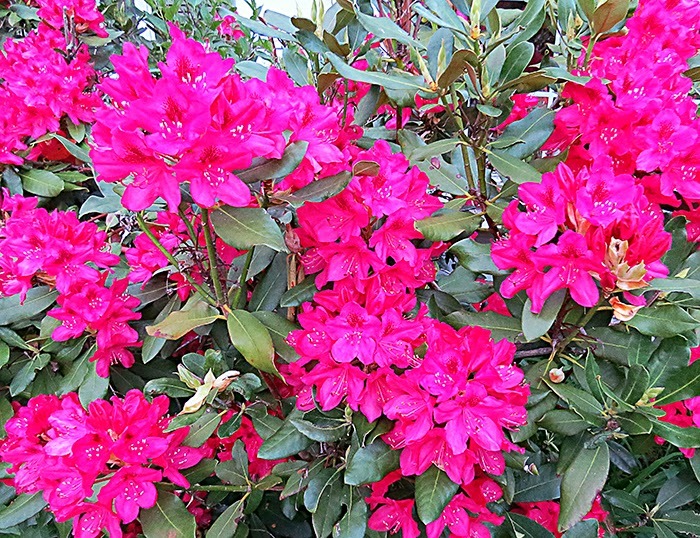 After the sun went down last evening, I took a photo of the Mrs' magenta rhododendrons. They are just beautiful. My rhodies have large buds on them, but they aren't ready to blossom yet. For some reason, my flowers always seem to blossom a couple of weeks after the Mrs' flowers. I wonder if maybe the reason might be because of all the tall trees here. Hmmmm. My granddaughter Jasmine has been invited by another local theatre group to audition with them for a part in their new production, Bye Bye BIrdie. Jazzy's audition is tomorrow morning at 9:15. Good luck Jazzy! Her brother Kevin has joined a new baseball team, this one for 16 to 23 year olds. This will be good for him because he is a very good player and needs the challenge of playing with the older guys. (He is 16.) I'm looking forward to going to some of his games. The dust bunnies and I have been doing a bit of negotiating. So far, they are willing to have fifteen families move out later today, and another fifteen families will move out over the weekend. It's not a lot, but it's a start. Well, that's my news for today. So, till Sunday, Y'all have a fantabulous weekend. Good afternoon. I slept in very late this morning because I was not able to fall asleep during the night, and tonight is a work night. Tonight, and next Tuesday night are my swap nights to work so that I can have this weekend off. Yesterday was dam and gray all day. This is not a complaint though, because it was a very good day to do a few chores and catch a nap. DIL Janet came by after work, and we enjoyed some Stouffer's macaroni and cheese for supper. She brought me a gorgeous set of orange polka dot pajamas. My goodness, they are so pretty!! Then we spent the evening chatting, crocheting and watching TV. A very good night indeed. Today, the sun is shining and it is warm outside. Pogo and I will go out in the yard for a while to soak up some of this wonderful sunshine. Hopefully, this weekend we will have lots more of it. I haven't been doing much in the way of scrapbooking for a while now, but I have lots of scrapbooking stuff on my computer. I'll try to zip some of it up, and offer it here as freebies if any one wants it. 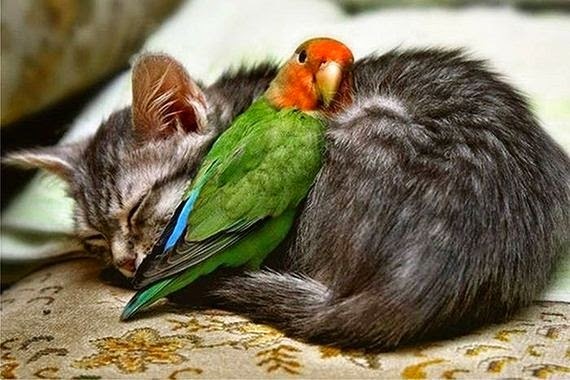 Friends have sent me lots of wonderful images (found on the web) of animals called "Pillow Pets". There's quite a few of them so I'll break them up into groups for posting. Here is the first set. 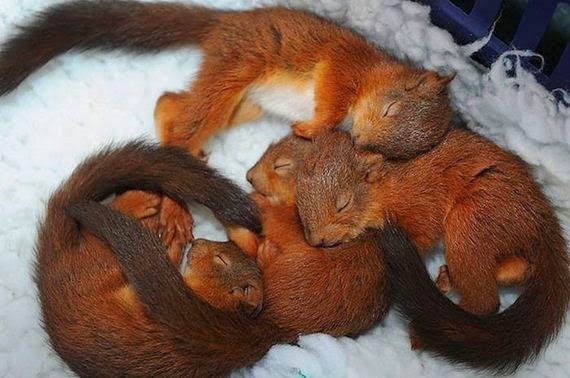 These animals are just so darned cute! How can you not love them? The first red, white and blue afghan is getting close to being finished, so I'll have to take a different one with me to work tonight to work on once the Mrs is asleep. Soon, I'll take some new photos. Blogger is acting up a bit now, so that's it for today's post. Till tomorrow, Y'all have a wonderful day. Good morning. Tis a wee bit damp and gray this morning. During the night we had a thunderstorm, but it did not last too long. When the thunder started rolling around, Pogo got up and walked around barking at the noise a bit, then got back into his little bed and went to sleep. This morning, though, he was on me bright and early (6 a.m.) to get up and play. He has a new hobby. Most mornings, around 5:45 a.m., he sits by the laundry room door in hopes of seeing Joe and getting an early morning snack. That's about the time that Joe gets his lunch from the refrigerator and leaves for work. So far, Pogo has managed to get one morning treat. I'm watching on the news about the I-Phones being hacked and held hostage. I-Phone owners (in Australia) are being asked for $50 and $100 to get their phones unlocked. This is just amazing. Is it any wonder that I do not believe in doing my banking and paying my bills via my cell phone? Not on my computer either. Phones are hacked or stolen and PC's crash every day. I'm old fashioned, and like a little more stability and control. Yesterday, Joe got the lawn tractor going and mowed the lawns. We even brought out some of the lawn furniture. This weekend, we are hoping to go shopping for a new weed whacker, and I'd like to look at some fencing to make a yard for Pogo. My little guy loves to run in the grass. Today I have some sayings to share that were found on the web. My favorite is the last one. 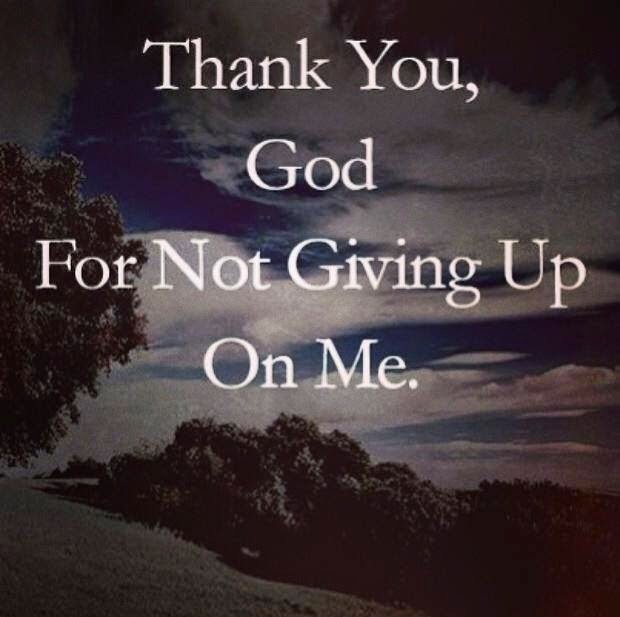 Through all my life ups and downs, He has always been there to see me through things. I have so much to be thankful for. Yesterday, I gave the dust bunnies a reprieve and spent the day doing laundry and making sure all the scatter rugs were washed. Today though, I'll have to weed out some of the bunnies. Yuk, yuk, yuk. Well now it's time to get started on this new day. 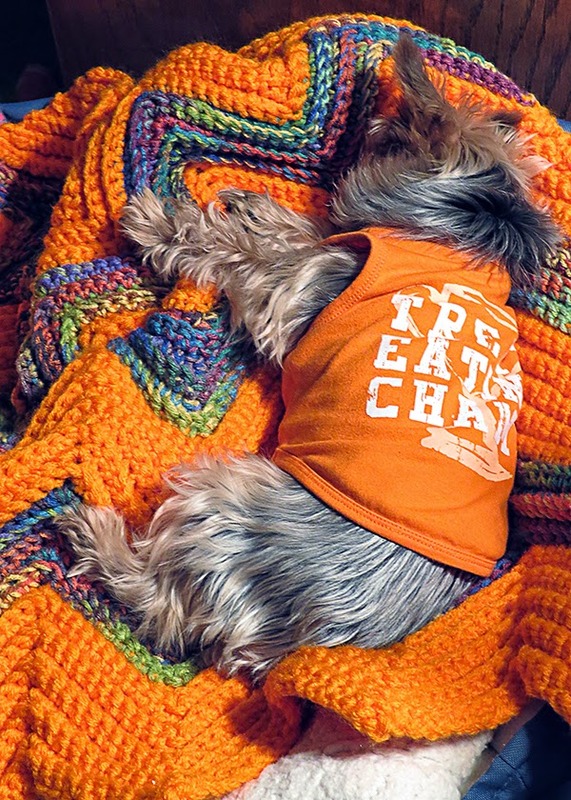 I want to finish my chores this morning so that I can spend the afternoon working on the afghan. It is more than half done and looking really pretty. So, till tomorrow, Y'all have a wonderful day. Good morning. It's looking pretty nice outside right now. The sun is shining and it's a comfortable 70F degrees. Later this morning it is supposed to start cooling down, and by this afternoon the temps should drop by close to fifteen degrees, and more rain should move in. Yesterday turned out to be a really nice day, even though we had spells of rain with not a lot of sun during the day. It was a perfect day to catch up on my sleep, and just be lazy. That means I watched TV and crocheted. Today I really must get a few things done around here. Like laundry and vacuuming. I also need to spend a few hours changing all my passwords. There was a problem at E-bay where hackers got into their files and stole a lot of customer information. It's really quite sad that some folks put all their energy into designing programs to hurt so many people. Imagine what these minds could do if they were put to good use! Pogo and I did spend a little time in the yard yesterday, and I got a couple new photos to share. 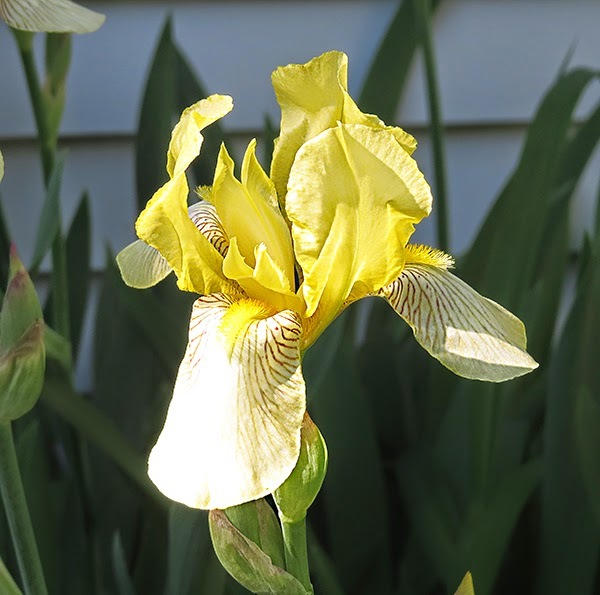 One of the new Iris plants is blossoming, and their were two blooms on the orange rose bush. 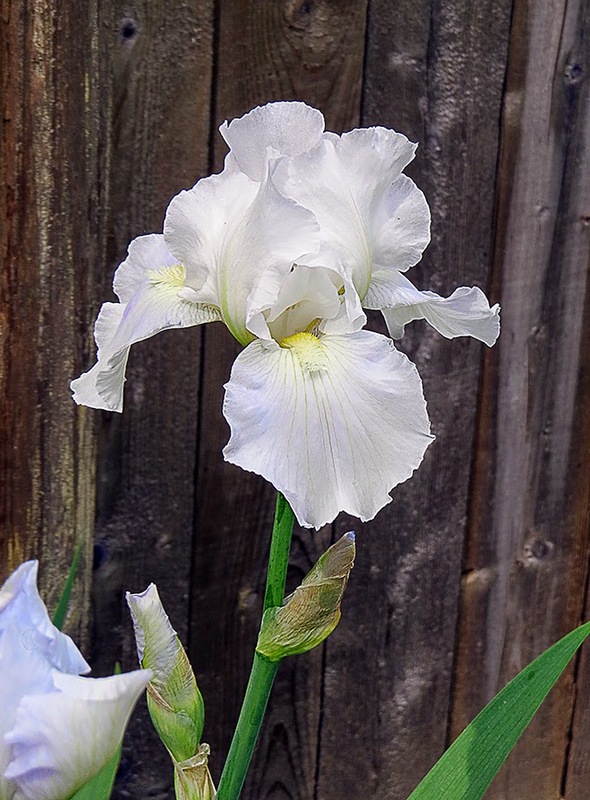 I don't think I've ever seen an all white iris, and this one is really beautiful. All the veggie plants looked to be doing pretty good. The grass, however, is needing a good mowing. It is so tall that Pogo can't see over all of it. Joe was going to mow the lawns yesterday, but with the rain we decided to do it another day. Last night I was shopping around on-line for large plastic zippered storage bags to put my afghans in. I'll check Walmart this week to see if they carry any. I also need to pick up some plant supports. My irises are growing so tall that they fall over easily. Plus we'll be needing a few for the veggies. Well, that's it for my news this morning. Now it's time to get started on this beautiful new day. Till tomorrow, Y'all have a fantabulous day. Good morning. It started out sunny here, but soon turned gray with a light rain falling. It's supposed to get quite warm today so I'm hoping that the sun comes out again later this morning. We were going to do a bit of yard work today, and have a barbeque later this afternoon. Plus, I'm sure there are many parades scheduled for today. Here's hoping! Jeepers, but the Mrs was wicked horrid again last night right up till she finally decided to go to bed. I can't imagine why she is so miserable all the time. She has had a very good life with plenty of money to travel and do fun things. Her family all live within minutes of her house, and she has a lovely home with a beautiful yard. During the night, I heard lots of noises coming from outdoors. This morning when I looked outside, I found lots of trash and garbage all over the doorstep. Critters had gotten into the barrels and made an awful mess. There were little ants everywhere! I cleaned it all up, and hopefully someone will put the locking lids back on the barrels later today. After the Mrs was asleep, I worked on my afghan for a while. I love how the colors are working up. This morning I took some photos. The red is a deep cherry red and the blue is a deep royal blue, but this was the closest my camera could do. 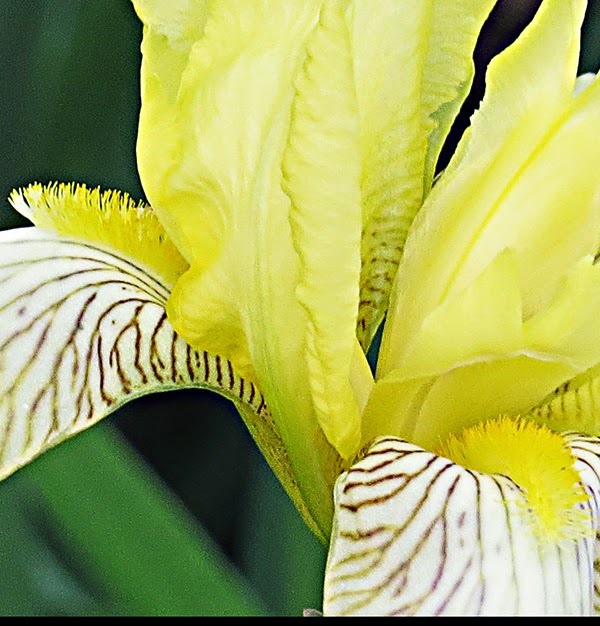 Yesterday, I took some photos of my yellow iris. There are so many of them and they are just beautiful. 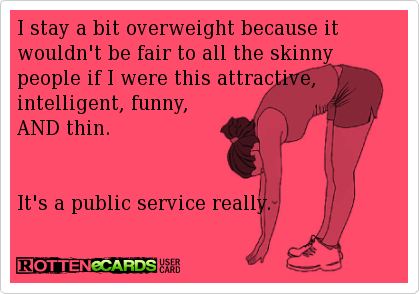 However, they are so tall that they keep falling over. So, we cut several of them and put them in a vase. Pogo and I are watching The Dinosaur Train on TV this morning. I know it's for kids, but it is very interesting. 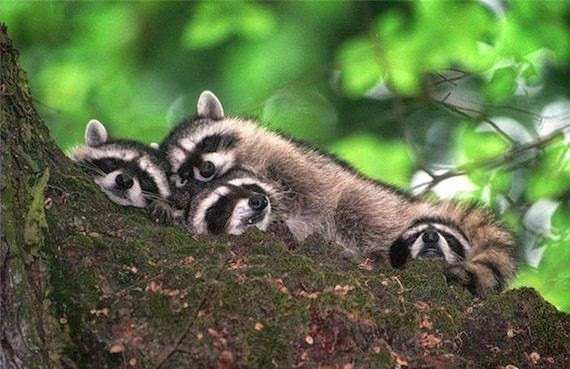 Today we will have a peaceful, relaxing day. Even though I crab every now and then, it's a good life and I'm thankful for it. 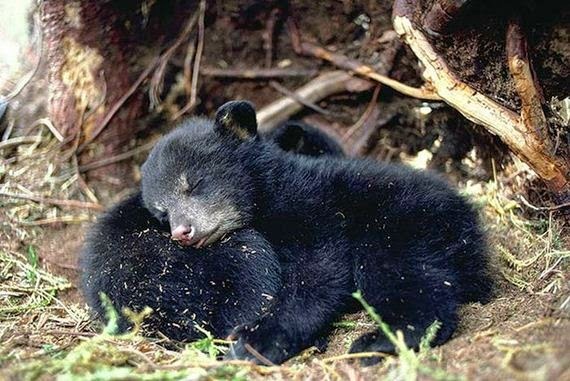 So, till tomorrow, Y'all have a peaceful and happy Memorial Day. Good morning. It's early yet, so the sun isn't up yet, but today is supposed to be quite lovely with maybe a few rain showers this afternoon. I'm at work, and have been trying to get a few photos of the hummingbirds, but they are just too wary and quick. Remember how I said that the new red yarn was super thick and course feeling? Well I gave it a good try. I did a whole set of red rows, then the multi color yarn, then some blue; twenty rows in all. The difference between the yarns was wicked noticeable. The red part was feeling like a thick rug. So, I pulled it all out. I had picked up some more red and blue yarns at Walmart, so I started the afghan over again, using these new yarns. Wowser, what a difference! This time my afghan feels like an afghan. I'll have to call JoAnn's and see if they will replace the thick red yarn. Once I get a whole patch of the blue crocheted onto the afghan, I'll take a photo so that you can see just how pretty these colors are together. Last night I brought the afghan to work so that I could work on it after the Mrs went to bed. Alas, when I looked into my bag, there was no crochet hook. It seems I forgot to put it in the bag. Bummer. I think my brain needs a vacation. My family has always been quite patriotic, and we love waving our flag. 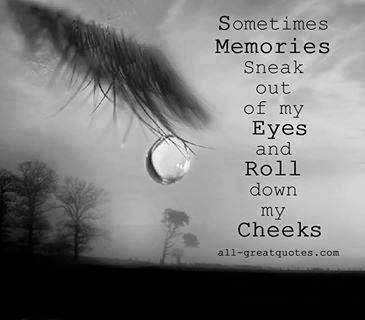 So today I have some sayings from the web to share. If anyone is offended, so be it. Ever notice when you fly in a plane, one of the first things they tell you is that in case of an emergency always take care of yourself first so that you will be able to help those with you and around you? It makes a lot of sense. So why is it that we seem to have unlimited funds to save the whole world, and none to save our own people? And when is the last time you heard people getting excited about saving our animals? 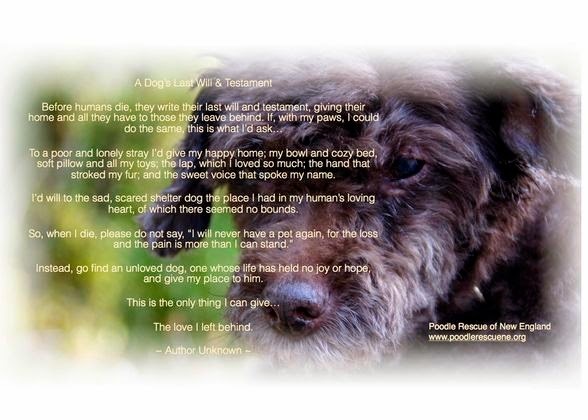 In all the stories that I watch on TV and read about in the newspaper of the floods, wildfires, thunderstorms and tornadoes, you rarely hear about any people looking to save pets and wildlife. Once in a while someone will find a pet that survived and it becomes a feature story on the news. But what about all the others that are lost? Many of our local towns and cities will be having parades this Memorial Day Weekend. Recently a neighboring town held a Haitian Flag Day celebration. But then the local citizens had to fight to have their Memorial Day parade. What's wrong with this picture? 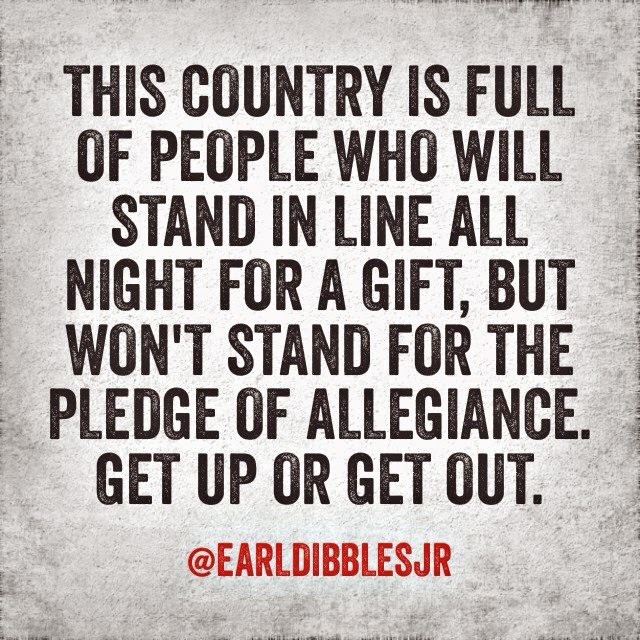 Since when should we have to fight to show love and respect for our own flag and country? Many men and women gave their lives so that we could enjoy living in this wonderful country. Why can't we keep all that is wonderful about it? 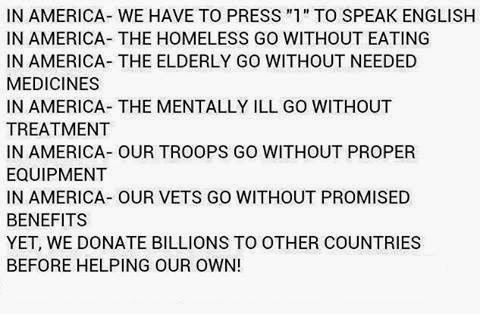 Sadly, I wonder what sort of country we are leaving to our grandchildren and great grandchildren. What sort of morals and ethics are we teaching them. 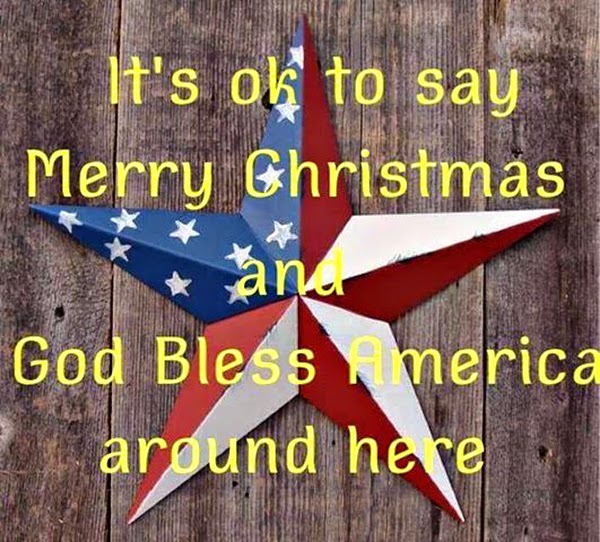 This has always been a great country to live in. 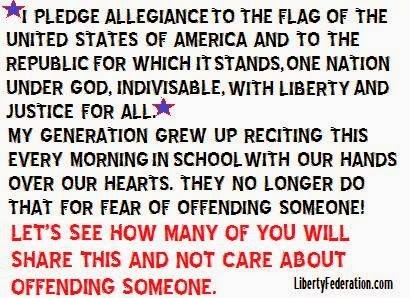 Can we pass this same great country on to our children? Well, I've rambled on enough. If you read this far, thank you for listening to this old woman. I do hope the rest of your day turns out to be great. Till tomorrow, Y'all have a fabulous day. Good morning. 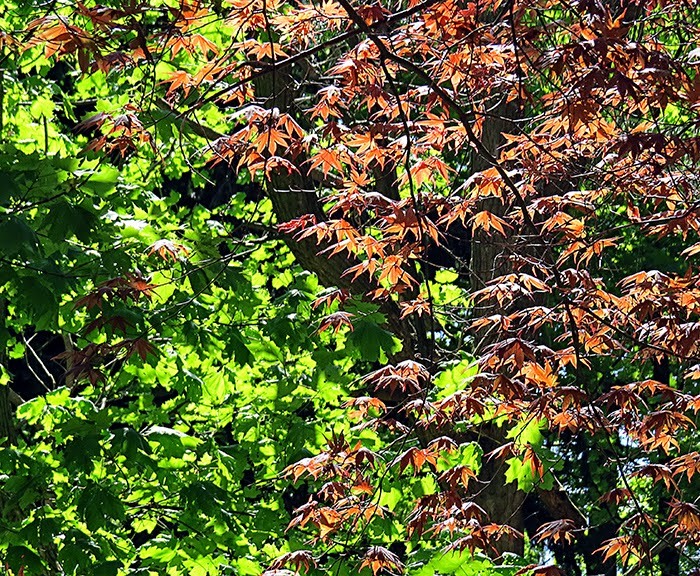 Has anyone noticed that the month of May is slipping away quietly? Another week, and it will be June. Ever notice how the months November through March seem to drag on? But then along comes May, and the months start slipping away quickly and quietly until the cold season comes around again. In a few days, it will be a new month, and in just a few weeks, the first half of the year will have gone by. Goodness, it doesn't seem possible. 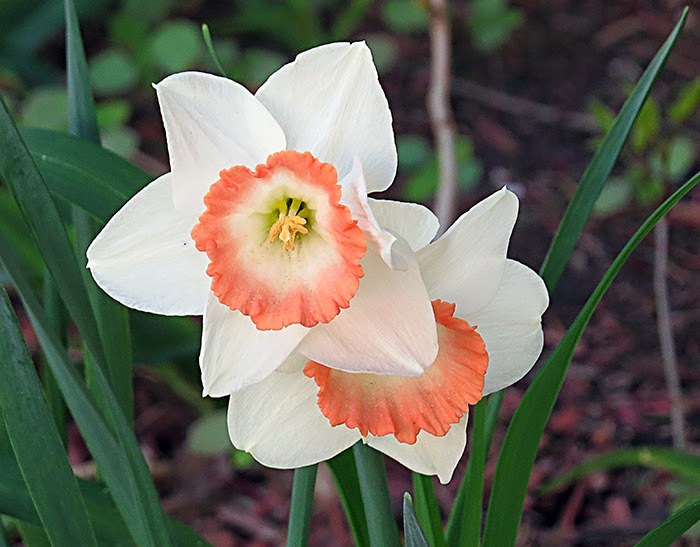 It's kind of sad to see Spring leaving soon because it took so long to get here. However, in a few weeks, Summer will begin. Here's hoping that the summer weather is good to all of us. Today it is cloudy here in New England with spots of rain expected. 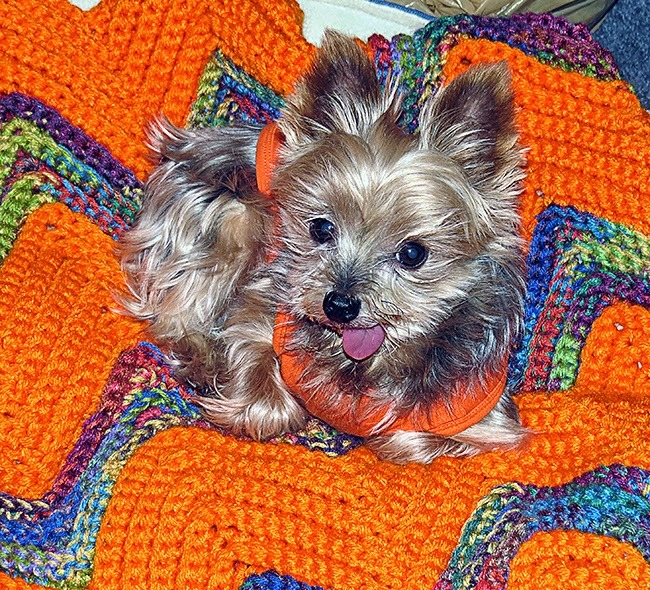 Once the laundry is done, it should be a great day to curl up with my little dog and some yarn and a crochet hook. Later this afternoon I'll take Joe to do some food shopping. Yesterday I went for my stress tests, however once I got there, the doctor decided to put them off until next Fall. I have an outbreak of eczema on my midriff, and have to keep medicine on it. The tests would have just made the eczema worse. I only have this problem when the warm temps set in, then it clears up in the Fall when the temps are much cooler. So I shall go back in the Fall to try again. When I got home from the doctor visit, I found a large box waiting for me. Yup! My new red, white and blue yarn had arrived. I could not wait to start using it right after supper. However, for some reason the red yarn is so thick that it is not working up nice. I only did a few rows with it, then stopped. This afternoon, I will see if Walmart has any of this red yarn, and hopefully it will not be so thick. I have to tell you that the colors themselves are just beautiful, and I can't wait to actually get working on this new afghan. Today I have some images from the web to share with you. This first picture is quite interesting. 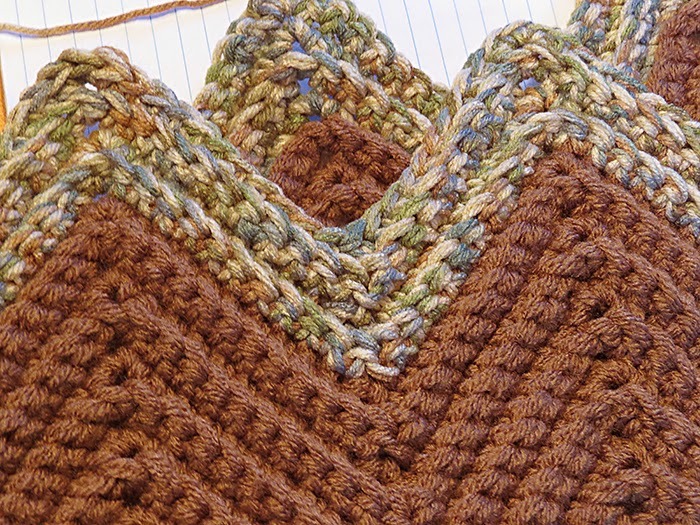 For those of use who use yarn in your crafts, this is a great way to use some of our scraps. 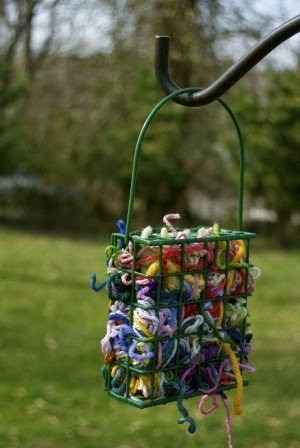 Hang a bird treat holder, and fill it with scraps of yarn for the birds to use for building their nests. You can also tuck in bits of fluff (lint) from the clothes dryer vent screen. 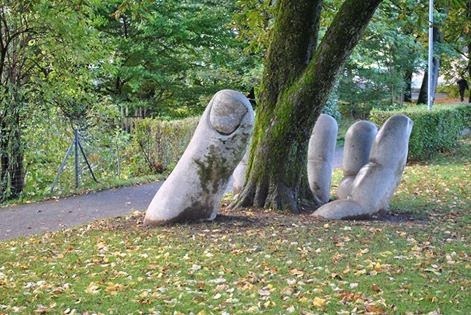 The birds will really appreciate this. 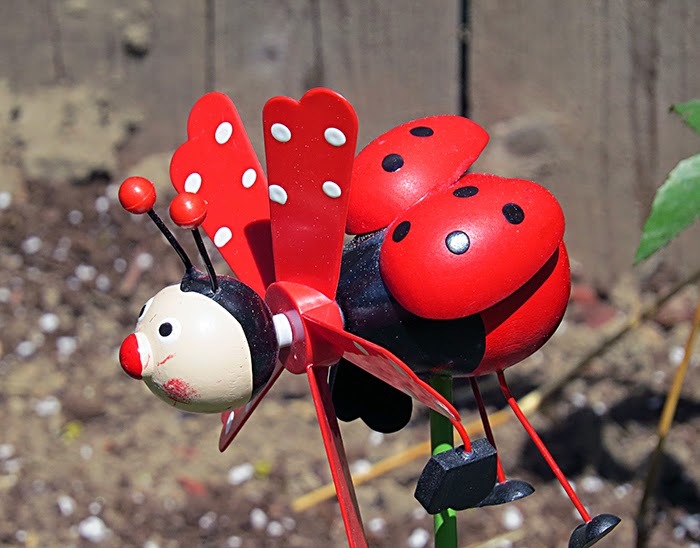 The next image shows such wonderful whimsy and creativity. It's such a fun way to liven up a meal or a party. 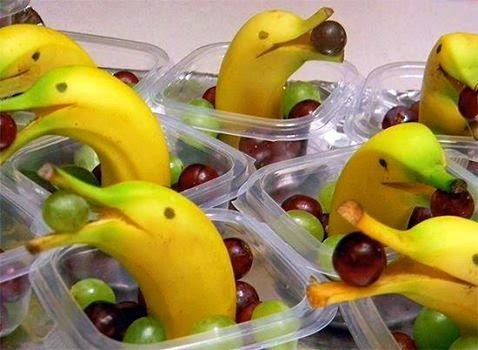 It's called "Dolphin Fruit Art". These last two images really touched my heart, and need no explanations. Well, that's all my news for this morning. Now it's time to pay a few bills and get them into the mailbox. I want to enjoy the rest of today. Tomorrow it's back to work again. So, till Sunday, Y'all have a fabulous weekend. Good morning. It's looking a bit cloudy outside, so I guess maybe that rain is going to catch up with us after all. That will definitely slow down the street work that is going on in front of my house. The town is cleaning the main water pipes. They have to run temporary water lines to every house and building on the street (a very long street) and all the side streets, then re-hook each building up to a temporary water supply, then clean out the main water pipes, then re-hook us all back to our original water hook-ups. I know, it sounds complicated and I suppose it is. I'm wondering where the temporary water supply is coming from. Why not just shut off the water supply for a few hours, clean the main water pipe, then turn the water back on? I suppose then they would not have an excuse to come into our basements? I don't like letting strangers into my house or basement when I am home alone. Maybe they will wait till Joe gets home from work to come in. I have become very cautious in my elder doddering years. Funny, I will fly hundreds of miles away to meet a total stranger, but I am cautious about a strange man working on the road by my house. Go figure! 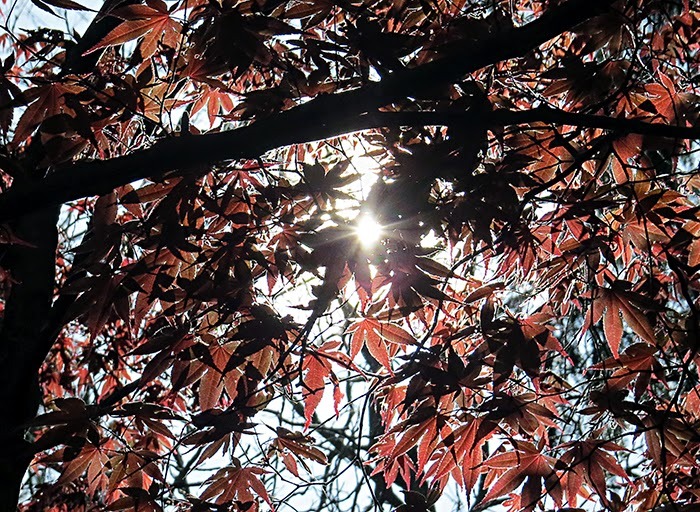 Today I have photos that I took showing different views of my trees. I love how the different textures and colors mix, and they are especially beautiful when the sun is shining through them. 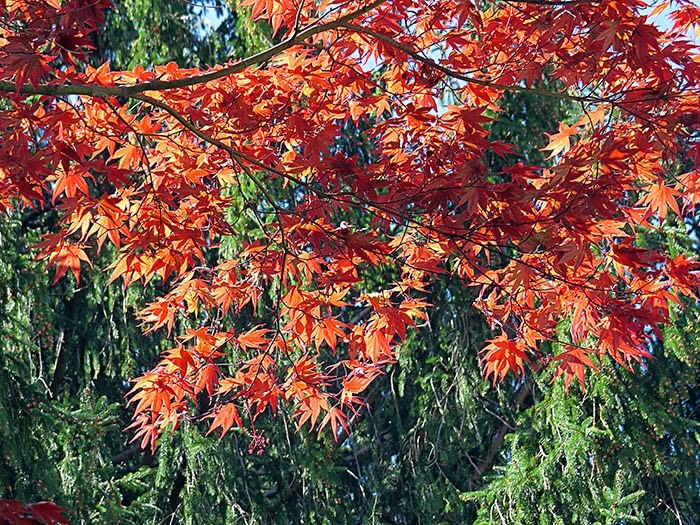 Mother Nature certainly does know how to put on a colorful show. 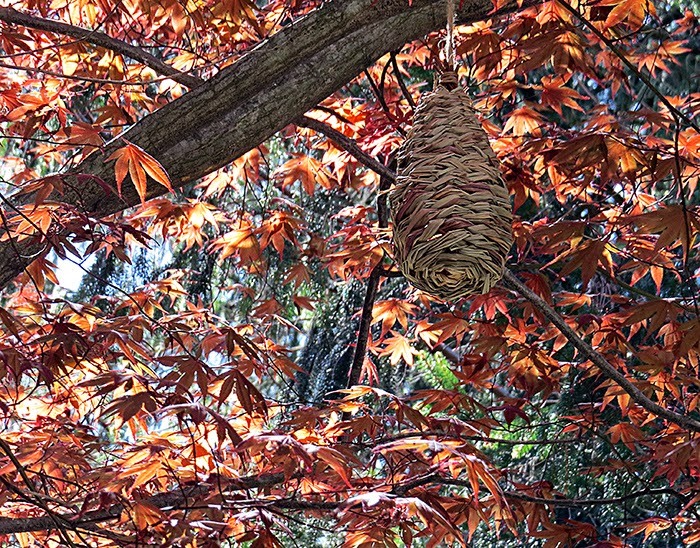 Here's a photo showing one of the bird houses that Joe hung in the trees, and a photo of the squirrel feeder. 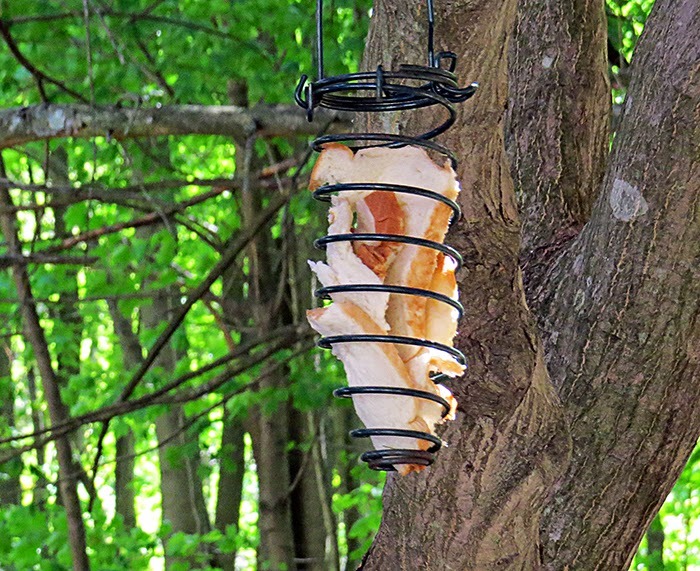 Sometimes we fill the feeder with corn, other times with left over bread. Other times, we sprinkle peanuts on the ground for them. Some of the birds like the peanuts too. I've been working on the brown afghan, and have about a third of it done. As soon as the red, white and blue yarn gets here, I'll set the brown afghan aside and work on a patriotic afghan. I have till next March to finish all the BDafghans on my "to do" list. In between, I have a few smaller projects in the works. After I finally retire, I may even try making a quilt. Mind you, this is only a thought at the moment. I like having different craft projects to work on. When I get tired of one, I pick up another for a while. This afternoon I have two appointments for stress tests. I am not looking forward to these, but I will do my best. However, I am not going to let them put in an IV line to put something in my system that will make my heart race quicker or harder. Here, I draw the line. Hopefully the good doctor won't get too upset when I say no. Yes, I know. I'm a brat. But it is my body. Now it is time to get a few things done around here. So, till tomorrow, Y'all have a wonderful day. Yesterday Was A Fantabulous Day! Good afternoon. My goodness, did we sleep a bit late or what? 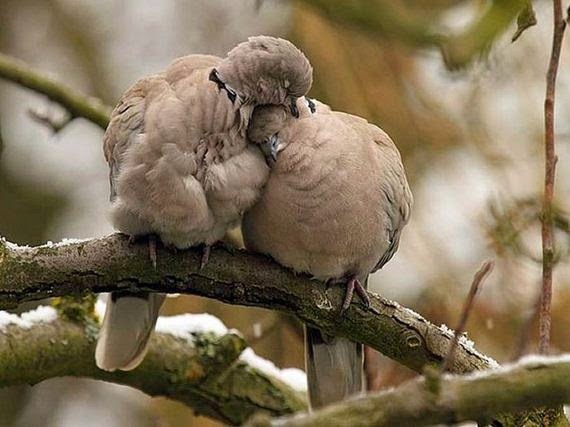 It seems that the room temperature, the mind and the body were all in sync with each other last night, and that brought on a long beautiful sleep. Ahhhhhhhhh, zzzzzzzz! Yesterday, we did a couple of errands, then Joe and Pogo and I went to the garden center to shop for veggies. There was so much to choose from, but we eventually picked out some tomatoes, yellow squash, green peppers, orange peppers and cucumbers. Of course, one cannot leave the garden center without some new flowers too. We found some lovely pink and white and purple petunias to make up a couple of hanging pots. I'll take photos of these when they are done. While we were shopping, a lady stopped to admire Pogo and his stroller. She said her little dog was eight years old and had a lot of trouble walking, and that she was thinking of buying a stroller. We told her about my pink stroller, and offered it to her. All she had to do was come by and pick it up. I gave her my card with my name and phone number. Around 5:30 p.m. she called and asked if she could come by to pick up the stroller. Folks, I never got rid of the pink stroller because it still had lots of use left in it. Only the zipper on the netting did not work. Well anyway, the lady came by, and was just thrilled with the pink stroller. Joe put it in the trunk of her car, and she left a very happy person. Somewhere, there's a little doggie who is going to enjoy going for walks in her new carriage. Mr. Pogo was also a very happy little chap yesterday. 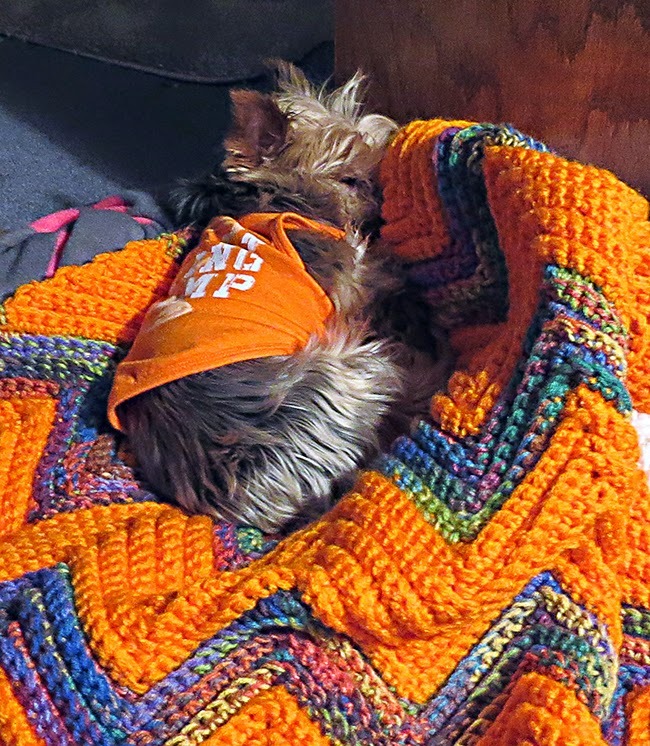 I finished his little afghan, and put it on his bed. He immediately hopped on it and made himself quite comfy. In fact, he snuggled right in and had himself a nice nap. 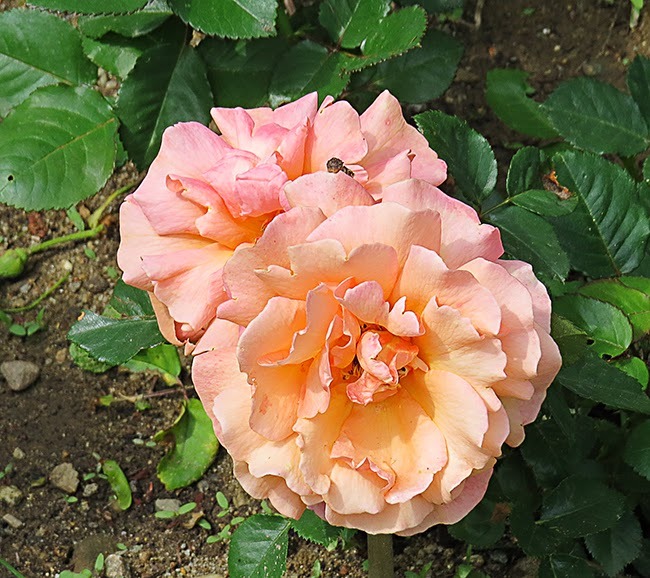 I also have a photo of one of the new roses. 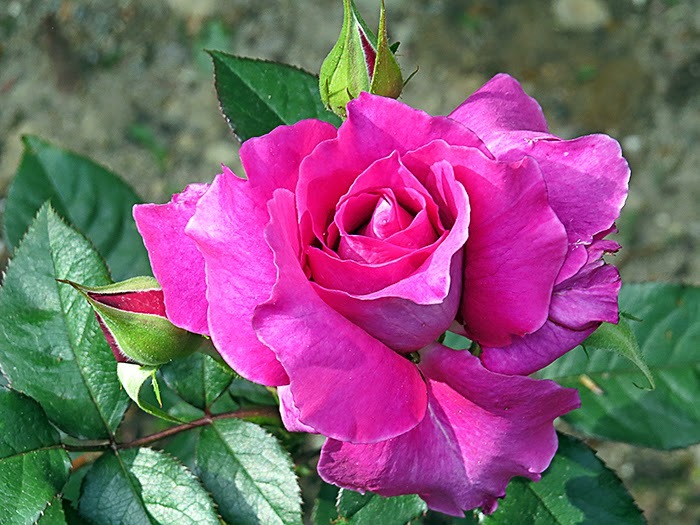 This one is the purple rose, and oh my it is just beautiful. The orange buds haven't opened yet, so I'll get photos of those later. Well, that's my news for today. DIL Janet will be coming by later this afternoon, and we will have our dinner and crochet fest. It makes for a really nice evening. So, till tomorrow, Y'all have a fantabulous day. Good morning. The sun is shining and it's going to be another beautiful day. However, it is cold in my house. Gosh, I do not like the cold!! The sun gets to shining on my part of the house later this morning. So until then, I will have to wrap Mr. Pogo and myself up in warm clothes. For me there is a nice long fuzzy bathrobe, and for Pogo we have a hooded sweater. I'm terrible, I know it. When I am cold, Pogo has to wear warm clothes. When I am warm, he can wear his light weight shirts, and when I am hot, he can go naked. It makes perfect sense to me. Yesterday was a nice lazy day for me. After breakfast Pogo and I played a while, then it was nap time for the mommy. Later in the afternoon, dwarf Helen and Joe and I were having some fun peeling and cutting up three huge butternut squashes. I cooked some of the squash up, and oh my was it ever delicious! Today is looking like another quiet day. Except for maybe running the vacuum cleaner and a few swipes with the dust cloth, I think most of my day will be spent crocheting and watching Law & Order re-runs. That's the plan until Joe gets home from work, and then we will go shopping for veggie plants for our garden. All my life I have been busy, busy, busy. At one time in my younger days, I was able to hold down three jobs, keep up my home and family and fit in a social life. All at one time. But that is the beauty of youth. Now I have reached a stage in my life where getting to spend lazy days crocheting, watching TV, cuddling with my little dog and taking photos makes for pretty exciting days. It's a good life. Speaking of taking photos, I have some that I took of my flowers to share. 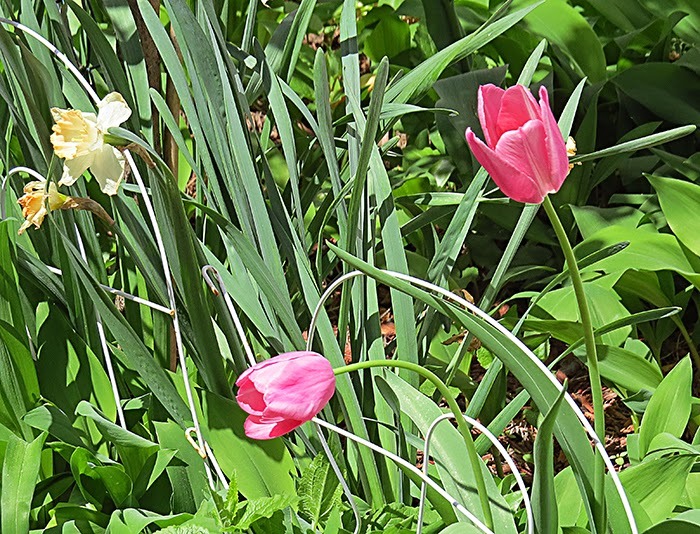 Most of the daffodils and tulips have passed by, but there are still a few stragglers. 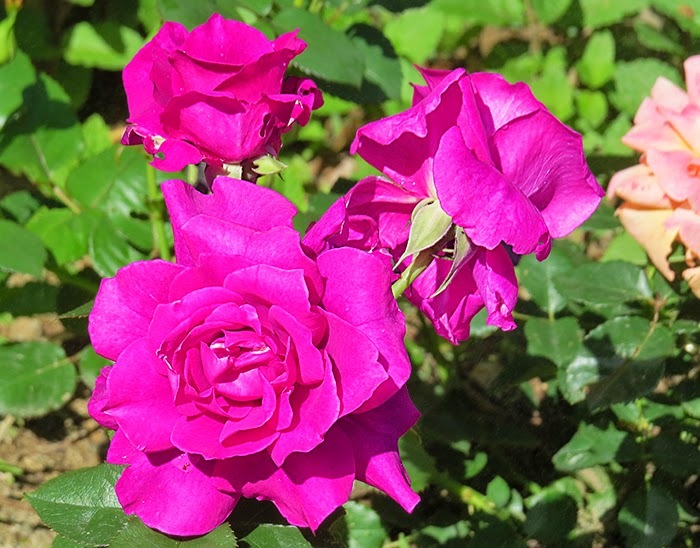 The new rose plants each have a bloom so today I will take some photos of them to share. I also need to finish putting down the new grass seed. Joe tells me that SIL Eddie dropped off the seed spreader so I will try using it. We were going to put out the lawn furniture too, but I think maybe we should wait a few more days to give the grass seed a chance to grow. Now it's time to get dressed and start this new beautiful day. So, till tomorrow, Y'all have a fabulous day. Yeah! My Lilacs Are Blooming! Good morning. At 5:30 a.m. it's cloudy outside. No sun yet, but the weatherman says we will have a sunny warm day with temps around 68F degrees. This will be nice because Pogo and I want to go out to do a couple of errands. Last night the Mrs behaved fairly well. Sometimes when she is going into her "cranky" mode, I can divert her attention to something that she is interested in. So far, this has been successful all weekend. This is good because it makes it more pleasant to be here at work. As I sit here typing, I'm noticing the sun creeping across the tops of the trees across the street. What a really pretty sight. However, there is quite a breeze because all the tree branches are moving. I have been looking everywhere for a red, white and blue variegated yarn but haven't had much luck. 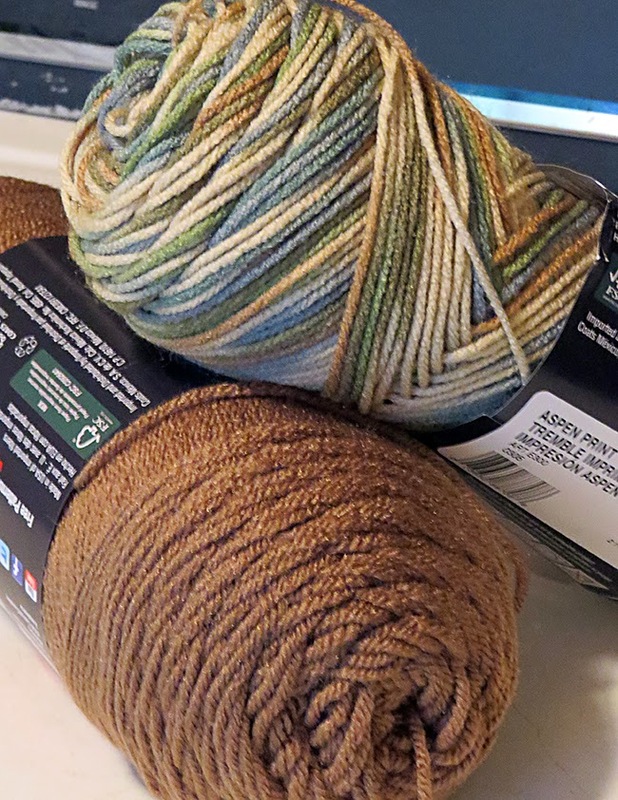 Yesterday, I checked JoAnn's on line site, and not only did I find the yarn, but they were having a one day only sale of 25% off all yarn in stock. Not only did I get the yarn at a great price, but I got free shipping too. Not a bad deal at all! Once that yarn gets here, I can pick up the matching shades of solid red and blue yarns. 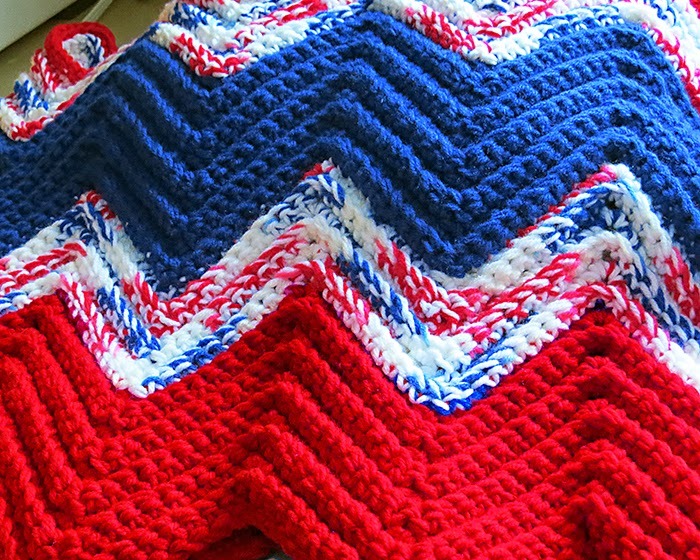 I've been wanting to make an afghan with patriotic colors. At some point, I'd also like to make something with a very pretty lime green yarn that I found. It looks like I'll be busy for quite some time. 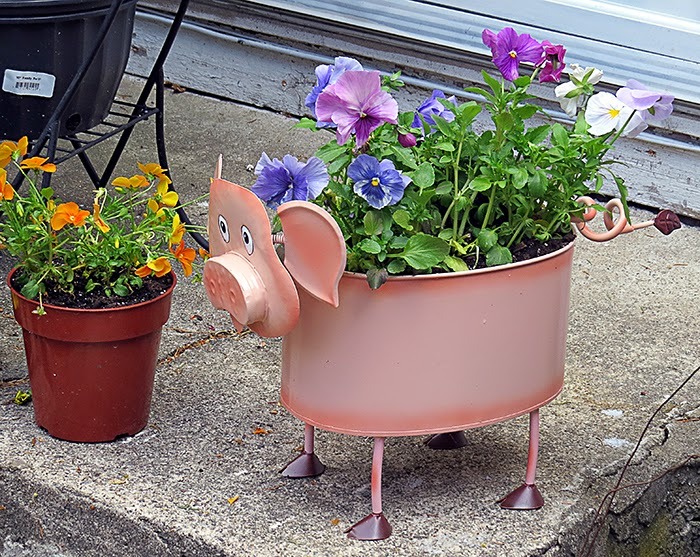 Today I have some photos of my new flower planters. This first one is "Piggy". Such a cutie pie to greet anyone who comes to my door. 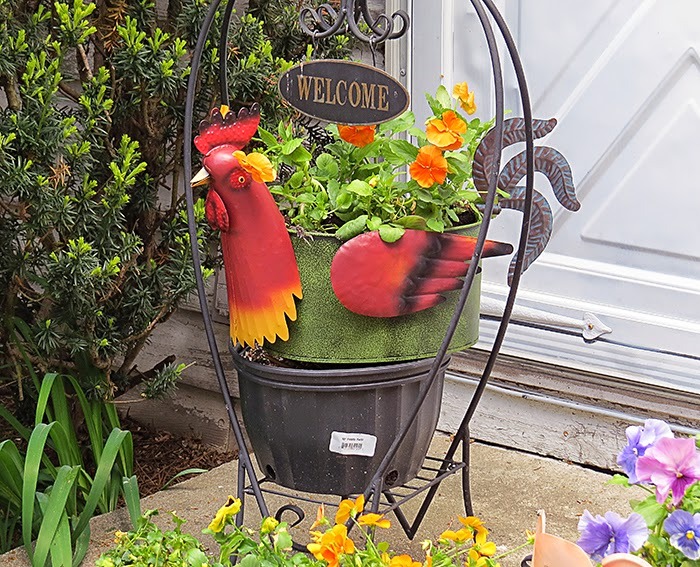 The second planter is a rooster, whose legs collapsed under the weight of the dirt and plants. No problem, he now roosts in my "Welcome" plant stand. 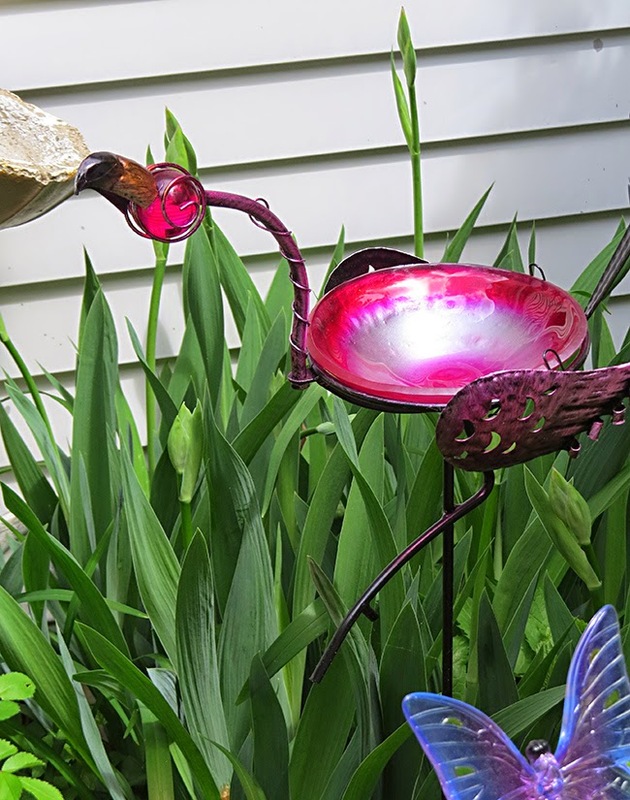 Two of the new garden ornaments double as a decoration and a bird bath. One is a peacock, and the other is a flamingo. 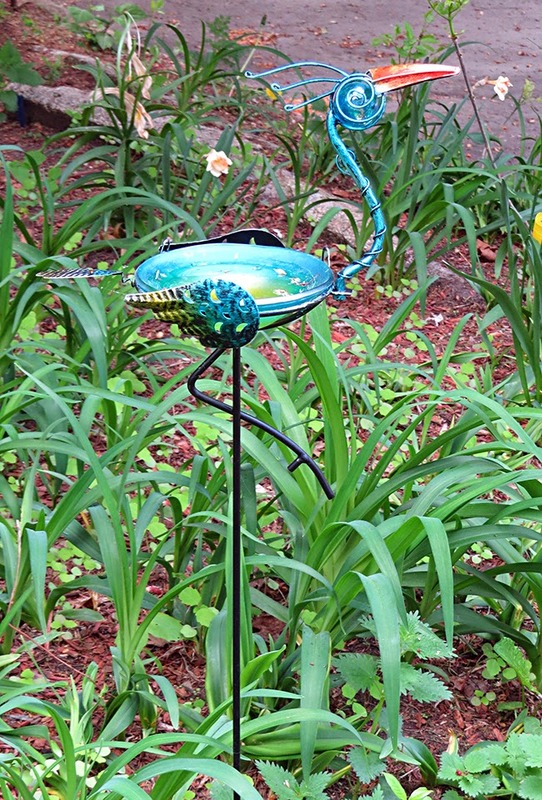 They look so pretty in the garden, and give the birds (and Chippy) a place to stop for a drink of water. Last, but not least, my beautiful new lilacs are blossoming. 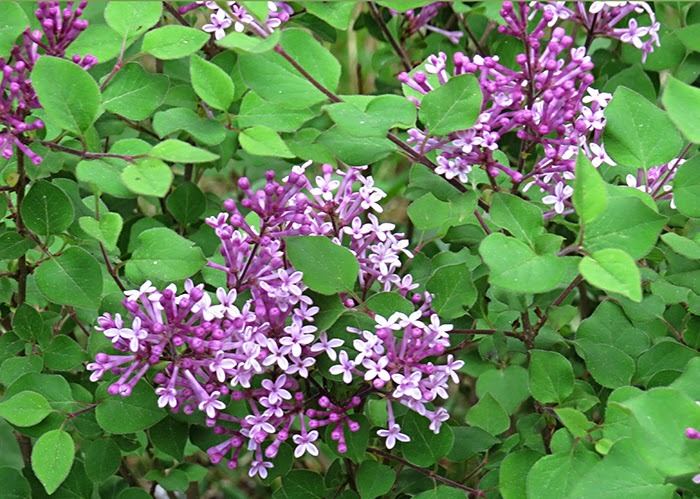 Oh my, I love lilacs. It's too soon to pick them as the bushes are still quite small, but they look so pretty in the yard. An update on Kevin -- he is recovering nicely from the pneumonia, and is still playing baseball. This is his first love, and there's not much that will stop him from playing ball with his teammates. He hasn't missed one game. Well, that's about all my news for this morning. Pretty soon it will be time for me to start packing up my things and get ready to go home. My little guy is waiting there, and will shower me with lots of doggie hugs. Goodness, what a great way to start a day! So, till tomorrow, Y'all have a fabulous day. Good morning. It is just lovely outside this morning. I'm not sure what happened to the five days of rain that had been forecast, but I am surely not complaining. We've had some rain showers here and there, but mostly sunny warm days. 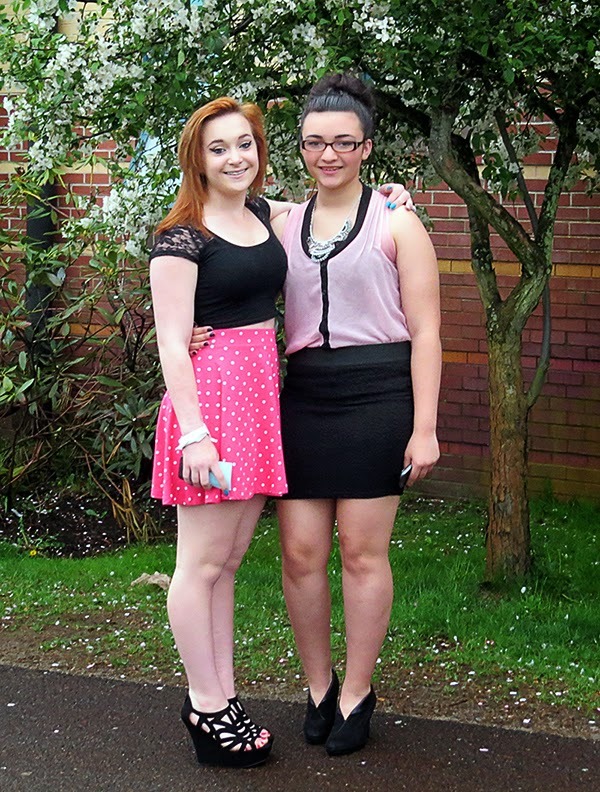 Friday evening I went to see the premiere showing of the films that Jasmine's school class has made. They've been working on the films for a few months, and finished two forty minute films as well as several short films. I am not a movie buff, but I have to give the kids credit, they did a wonderful job on their films. The audience was packed, and everyone was enjoying the show. I thought I'd show you a photo of some of the new yarn that I bought, and a little of what the BDafghan will look like when it is done. This one is a pretty warm brown and a multi color to match. I've been taking my smaller camera, the Canon SX50 HS, everywhere with me so that I can learn how to use it. It really does take great photos, but there is so much I have to learn about it. 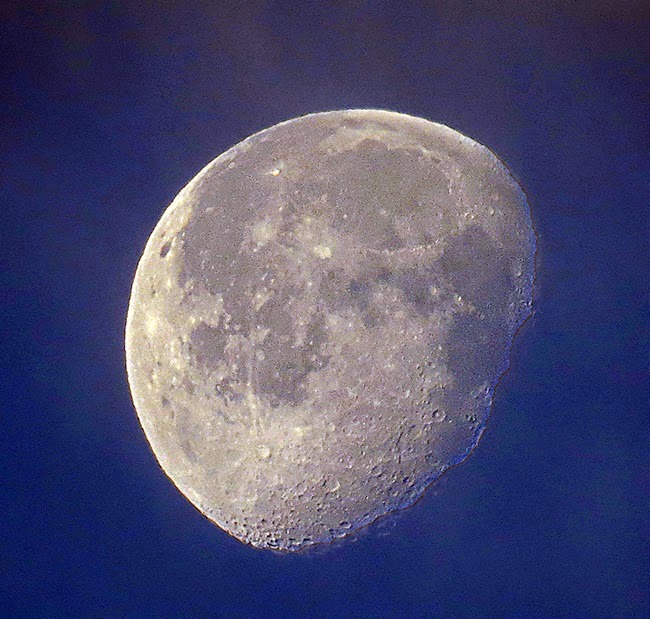 This morning before I left work, I took some photos of the moon. This first photo is how it looked when I shot the photo. And this next photo is the same photo, but I edited the color in Photoshop. Under "Image" I clicked on "color", "contrast" and "tone". It really brought out all the details. Notice how bright the whole left side is? That's from the sun that was shining brightly. 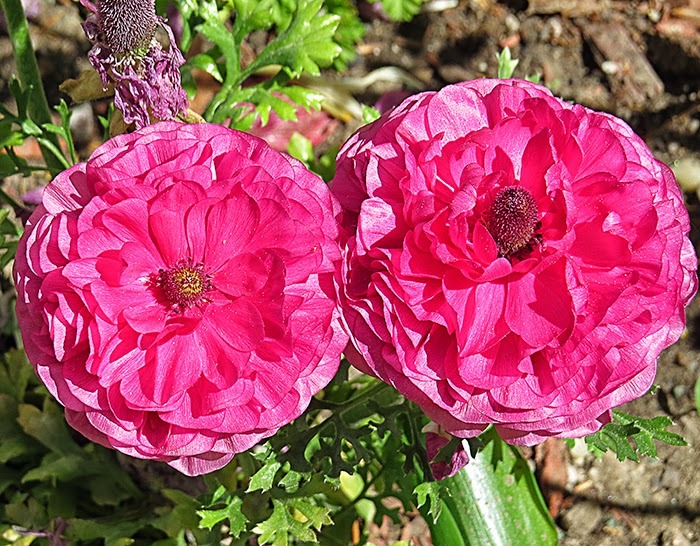 I do have lots of photos from the garden, but I'll spread them out throughout the week. Also, yesterday the mail lady brought me another package. Gosh! I just love packages! Inside was a beautiful photo book that Audrey and Mac and Wanda had put together of photos from the trip to Florida last March. Kids, I love my book. You did a fabulous job with it!!! Here's a photo of the cover and an inside page of my beautiful new photo book. 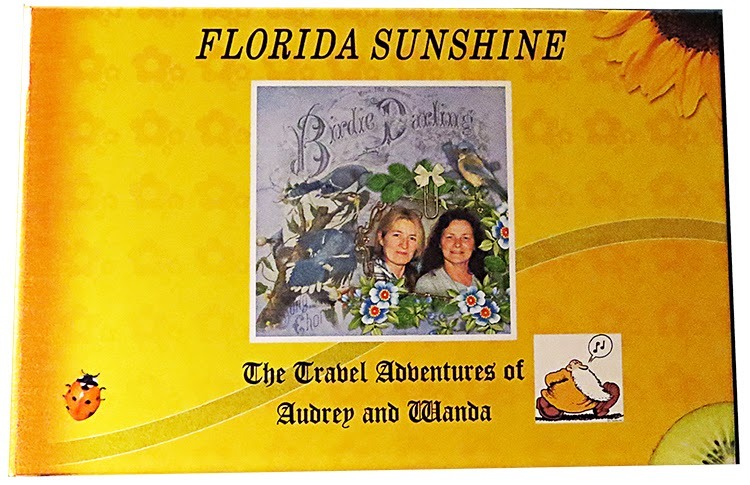 They had it printed at Adoramapix.com. Well, now I think I'd better change into my jammies and try to get some winks. Tonight it's back to work again. Last night, the Mrs behaved fairly well until about 4:20 a.m. this morning. Then she started getting a bit feisty, but I was able to turn her mood around and talk her into going back to sleep. So, on that note, I'll see you tomorrow. Y'all have a fabulous day. Good morning. The sun has been shining all morning so far, but the clouds are moving in. We will be expecting rain on and off today, then all through the night. I think this is the beginning of our monsoon, although the weather man says we will get a nice day in the middle of all the rainy days. I think Mr. Pogo has caught a bug or a cold. He hasn't been eating very good these past few days, and yesterday the "squirts" caught him by surprise. Last evening, I got a roasted chicken for his supper, and he wouldn't even eat any of it. If this keeps up, I'll call his doctor on Monday and see if I should bring him in for a check up. Kyra asks that I post a photo of the new yarns, so later today I'll take a few photos. If I can finish getting the new planters filled, I'll take photos of them too. 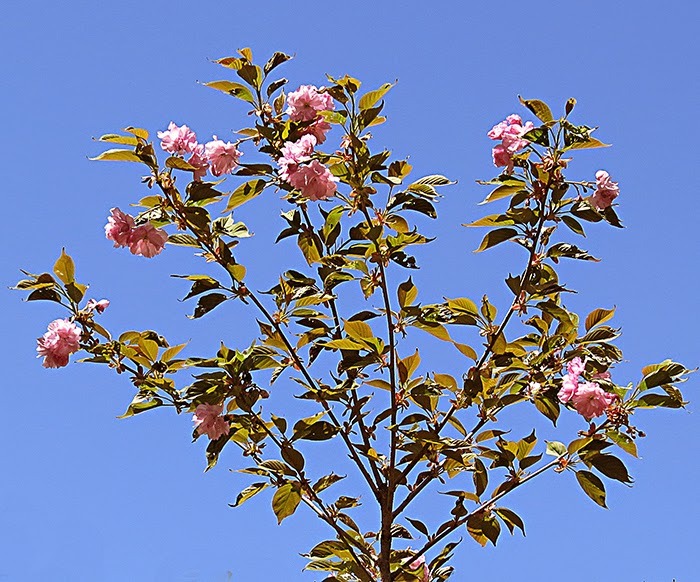 This morning I have a really pretty photo of the top of our cherry blossom tree, along with a couple of cute little garden critters. Today I must do some laundry. I also have a couple of scatter rugs in need of a washing too. Maybe I'll wash Pogo's little blankets too just in case there are some of his "cold" germs in them. Do you ever read the "Word Power" column in the Readers Digest Magazine? It's really quite interesting. Do you know what these words mean? Now it's time for me to get dressed and get a few things done around here. The wash won't get started by itself. (unfortunately) So, till Sunday, Y'all have a fabulous weekend. ANSWERS TO WORDS: Planchette - B, Whammy - C, Sibyl - B. Did You Pick A Derby Winner? It Looks Like It's Going To Be A Gorgeous Day!